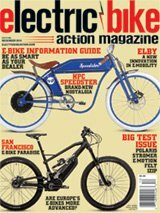 Showing just how quickly a bike brand can jump to the line with some diverse offerings, just a few months ago we were reviewing a pair of folding bikes from Cosmo (RBA, October 2018) when from out of left field came the chance to test a fat bike. And we have to say, the Long-Range is a quite unique for several reasons. The first thing you notice is the drab olive paint and graphics that immediately make you think of a WWII-era Jeep. With the knobby tires, black details and the white stars on the frame, it really looks the part. The aluminum frame is beefy and looks strong like a soldier without too many extra accoutrements like an external battery. This bike has a battery that inserts into the downtube and makes it look almost like it isn’t electric. Almost. The frame does have some extra gussets, such as from the seatstay to the chainstay, to help keep the frame from flexing under the weight and power of this bike. That makes sense. What we couldn’t make sense of was the way the seat tube splits into an inverted Y at the bottom bracket. Maybe just to provide a shorter mounting place for the front derailleur, perhaps? Also attached to the seat tube is the controller. Most manufacturers these days put the brain of the system inside the bike, usually in the downtube with the battery. Cosmo decided to mount it externally, which would be handy if you ever have to access it. Fortunately, it’s in a black case and blends right in to the rest of the bike. The unbranded suspension fork offers 100mm travel and seems sturdy enough to handle the bike. The ergonomic saddle is way over-padded and also has elastomer springs underneath. Generic ergonomic grips grace the outsides of not-overly-wide bars. The 160mm rotors and mechanical disc brakes on a 53-pound fat bike? They really underperform. A front basket and rear rack are included with the bike, allowing it to carry up to 120 kilograms (264 pounds) of rider and cargo weight. That can be a lot of stuff from the farmers’ market. They’re all black to go with the rest of the militaristic color scheme. There’s an LED headlight that’s powered off the battery, and it’s quite bright and also fits well into the look of the bike. A red LED taillight is also included, but powered from its own battery and operated separately with choices of solid red or many eye-catching patterns for safety. The strange design of the frame had us shaking our heads. That’s a lot of work to position a derailleur. Note the externally mounted controller above the inverted Y.
There’s a twist throttle in addition to the pedal assist. The monochromatic LCD is large but shows a multitude of different parameters, from pedal-assist mode (there are 1–5, plus 0 for off) to current voltage and battery capacity, motor temperature, speed, current power draw and odometer. The Cosmo uses a Shuangye 500-watt brushless hub motor. Though the bike has 21-speed gearing, the rear hub motor doesn’t depend on that to control torque to the rear wheel like a mid-drive does. The battery is very neatly integrated into the downtube, resulting in a very clean look. A 10 Ah battery at 48 volt is roughly 480 Wh, which though it’s similar to many brands on the market that offer 500 Wh batteries (e.g., Bosch), at 48 volts, the power should theoretically be higher and the range lower. We’d say this saddle is over-padded. It was comfortable on short rides, though. This is the first bike we’ve seen in a while with a fairly long recharge time, up to 6.5 hours. Then again, slower recharging is generally healthier for batteries than fast recharging. The Long-Range is aimed at someone who wants a cool-looking, beefy, retro-military-style fat bike, but doesn’t have a military-grade budget. It can work well as a light-duty cargo bike for carrying stuff home from a shopping trip, but would also look cooler than a beach cruiser rolling down the road. The bike rides as well as it looks on pavement and accelerates quickly for being a big bike. As always, tire pressure is everything with a fat bike. On pavement, we kept the pressure high. Though everyone could hear us coming from the sound of the voluminous knobby tires, it was stable at all speeds and felt planted when cornering at speed. The cool thing about fat bikes is that you can lower the pressure for a much better and grippier contact patch off-road, and that volume can control some of the other ride qualities, like taking out bumps and vibrations. There’s a suspension fork that also does a fantastic job of soaking up the bumps. We found the fork to be fairly upright, making the handling a little twitchy for a fat bike, but actually pretty normal overall. The fork works well, and it feels sturdy enough for the heavy bike. In pedal-assist mode, the motor surged and wasn’t consistent whether we were on flat ground or ascending/descending a hill. It was more fun to use the throttle in conjunction with the pedals (or not using the pedals at all). You can control the max speed using the throttle or pedal assist by the power level. In level 1, you max out at 11 mph. Level 2 gets you to 13.5 mph, level 3 goes to 16 mph, level 4 goes to 19.84 mph, and level 5 tops out at 22 mph (they say 35 kilometers an hour, which is 21.7). Legally, this makes the bike a Class 3—but barely. We’d still call it unofficially a Class 2. In a perfect world, we’d love that level 0 still allows application of the throttle for control of power and therefore speed. That’s not the case, but this bike was livable with its current configuration. Massive 26×4.0-inch Kenda knobbies serve as the tank treads for this beast. The display, chock-full of information, has a power-draw section that shows how much power the bike is using at a given time. At rest, it’s a constant 12 volts. When riding, it’s all over the map. On flat ground, at the same speed, the readout showed 250 watts, then 350 watts, then 100, then 230, etc. The front-end geometry makes the bike feel pretty steep, but that also makes for easier handling. Remember, you’re on a fat bike, and they aren’t known for their great turning radius. Cosmo has done it right. We never felt like we’d go over the bars if we hit a big bump. Instead, it’s quite responsive for being a big beast. In the looks department, this bike turned heads and drew comments as we expected it would. The old-school military theme looks great and suits the bike. We don’t know if Eisenhower would have ridden one of these, but he might have if it was possible back then! Cable routing is mostly external and not perfect. We heard a strange noise from the front of the bike at one point, and it turned out to be the headlight cable dragging across the front tire. It’s an easy fix, though, with a zip-tie, or it could have been wrapped with a cable wrap. We felt the 160mm Tektro mechanical disc brakes are simply not adequate for this big bike. We hoped our initial impression was just because they hadn’t been broken in, but after riding long after the factory glaze wore off, they weren’t quite what we felt was strong enough for a fat bike of this size. Larger 200mm rotors, standard for mountain bikes, would have helped. They’re not really set up for this, but you could swap them out for hydraulic brakes instead. We’d suggest doing this, and at your local bike shop. This is a big, heavy bike that can go pretty fast, and not being able to slow down quick enough could be an issue. If you’re thinking of going long distances, you’ll want to go sparing on the motor power. It’s a big bike and uses power generously. We weren’t kind on our first ride at all, opting for level 5 most of the way with some climbing, and we drained half a battery in 10 miles. That may be more than most fat bike riders would push it, anyway, but we wanted to have fun and push the bike a little. It took it, and this isn’t the sort of bike we’d expect anyone to ride for long distances. This bike is more style than stamina, and like a rental car or an original Jeep, it begs to be pushed. The Cosmo is a good-looking, fun-to-ride bike with some quirks. It’s inexpensive, fast and good for someone who wants to turn heads and maybe someone who is into the military look. The range is far from stellar and overall motor performance was good, yet it surged unless you use the throttle. If you’re going to mostly use the throttle, it’s a fun, stable bike even at speed. Motor: Shuangye 48V, 500W brushless rear hub motor.